“Connection” to Darmstadt but tickets only to Frankfurt. What transportation can I take to Darmstadt and how do I prove it's paid for? The tickets only go to Frankfurt but the connection goes to Darmstadt. What do I present in lieu of a ticket between Frankfurt and Darmstadt, and what modes of transportation am I entitled to for this segment? Do I just show the e-mail reservation? Looking on bahn.de for this trip, it seems you take a bus from Frankfurt Airport to Darmstadt. It says "normal (international) tickets not valid , Subject to supplement", so (I am not sure but) it looks like you might need to pay for that separately. You say you ordered paper tickets, so if you have not received them yet, it might become clearer upon reading them. You can find the timetable and prices PDF (in German and English) here. A single one-way trip for an adult costs 8.60 Euros and can be payed in the bus in cash or at a machine, where you can pay with Maestro (and maybe credit card). Not the answer you're looking for? Browse other questions tagged trains germany deutsche-bahn or ask your own question. How can I search for French trains (only - no buses)? Can I apply for a new German Schengen visa, when my first Czech Schengen visa has not expired but only allows me to enter once? Boarding for my Eurostar is delayed and I'll miss my SNCF connection, what should I do? What can I do to get train tickets for fast trains in Japan cheaper? 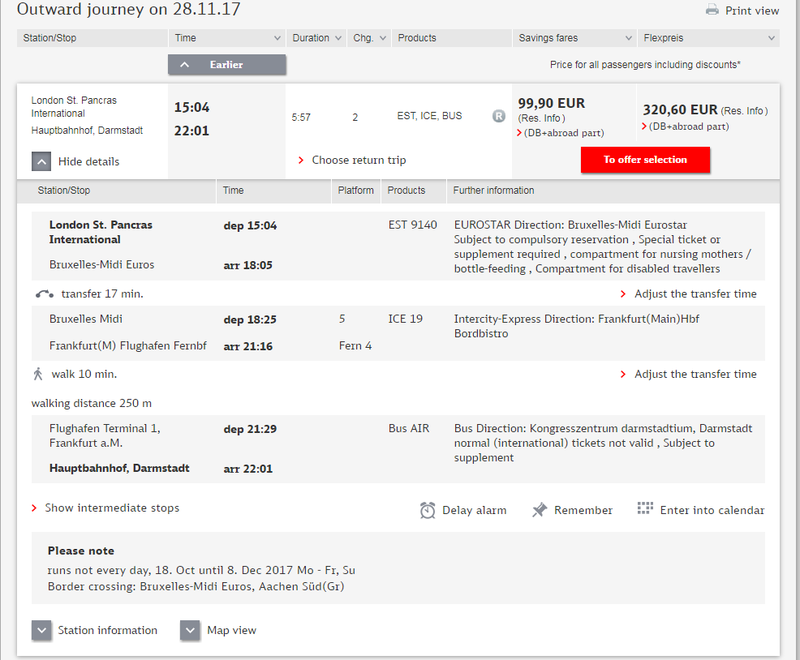 Can I change my seat on a Eurostar booking booked through DB?